With 10 lead changes and two matches decided in overtime, Whiteaker Middle School narrowly edged Claggett Creek 45-41 on Thursday, Feb. 23. 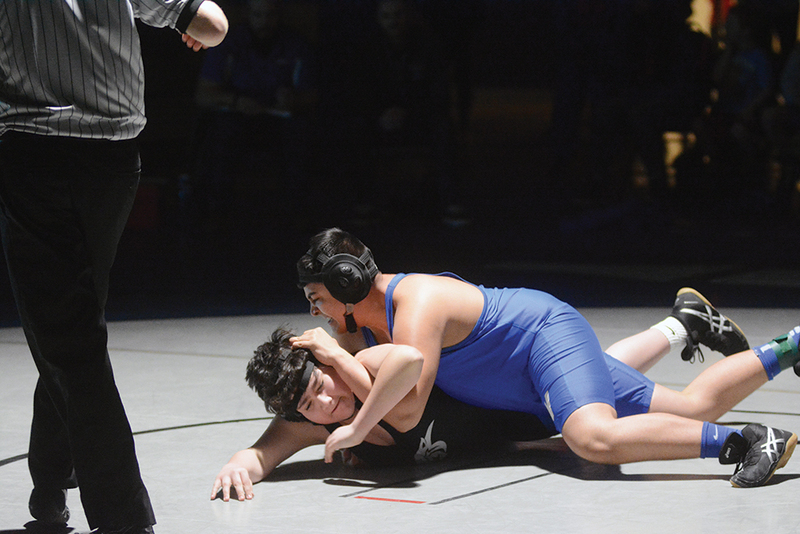 Wrestling under a spotlight and large crowd at McNary High School, Whiteaker seventh grader Aldo Villalvazo (195) got a pin in the first period to seal the win for the Wolverines. Both Matthew Araiza and Nick Martin won in overtime. At 85 pounds, Araiza came out on top 14-12. Martin then won 4-2 at 90 pounds. Hafer was also proud of Jeremiah Ratliff and Chad Croucher, who both lost by major decision but were able to avoid getting pinned, saving the team four points. Claggett Creek won four matches by pin fall—Brandon Blanco (75), Grady Burrows (95), Joey Hernandez (132) and Jayden Gomez (175). The 95 pound match appeared it might go another way as Whiteaker eighth grader Cameron Parks got Burrows in a cradle and near fall at the end of the first period. However, Burrows was able to recover and pin Parks in the second period. “It was a good experience having everyone watching you in the middle of the mat,” Burrows said. Burrows and Parks know each other well, wrestling on the Celtic Mat Club. Claggett Creek, which finished the season 5-5, won two matches by major decision, Jacob Carbajal 15-5 at 117 pounds and Logan Yoder 10-0 at 150 pounds. Heavyweight Michael Hettinger won by forfeit. Along with Villalvazo, Whiteaker won four other matches by pin fall—Giovanni Segura (102), Aiden McCoy (117), Gabriel Castro (140) and Brady Jackson (160). At 80 pounds, Ella Repp won her match 6-3 and Kayly Montero (220) won by forfeit. Whiteaker finished the season 8-2. Both the Wolverines and Panthers will take 10-15 kids to the middle school regional tournament in Woodburn on Saturday, March 4. The state tournament is the following Saturday. “It will be good experience for them to see what a real wrestling tournament looks like as opposed to just a dual meet,” Carr said.